On Thursday, 14 February 2019 (yes, Valentine’s Day), Dr. Kevin Houston, Kaleb’s dad and a Prof. at NMSU, visited. 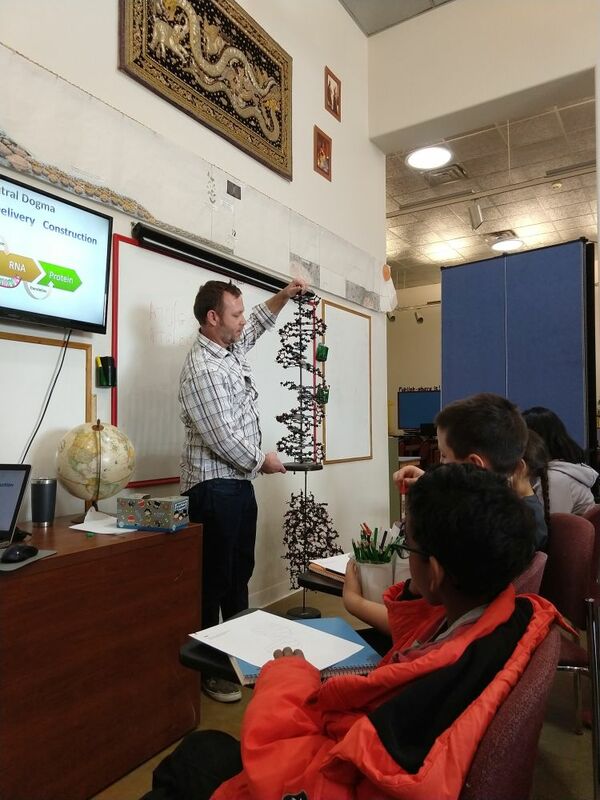 He engaged the class to learn about DNA being transcribed to messenger RNA and that being translated into the sequence of amino acids, or proteins. He brought large molecular models, one of DNA and one of the protein ribonuclease A that breaks down single-stranded RNA such as messenger RNA. He showed how DNA, a very long molecule is coiled an supercoiled to fit into tiny cells. The class guessed at how many different genes each human has (close to 20,000), and then learned that most DNA does not code for genes but helps control how genes are read and expressed.